A car’s horsepower rating is generally measured at the wheels or engine crank. Automakers advertise the latter number because it’s higher, but some cars actually end up putting down more power than the manufacturers claim. And that’s a corporate lie we might not complain about. A car will always have less “wheel” horsepower than “brake” horsepower because each component between the engine and the asphalt adds another layer of drag. 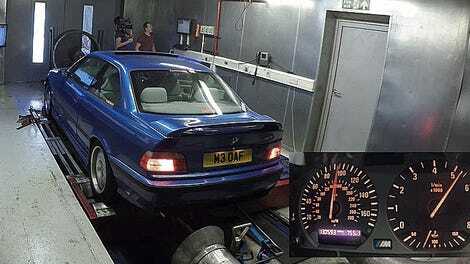 That’s why verified dyno runs offer a much more practical assessment of a car’s power than specs from a manufacturer. Two cars with the same brake horsepower could have different wheel horsepower readings because the transmission, driveline, axles and wheels affect the figure. Brake horsepower isn’t called brake horsepower because it’s measured at the car’s brakes; the term actually refers to the “Prony Brake” which is a simple machine invented in the 1800’s to measure an engine’s output. As to why a company would under-report its car’s power, that’s a little more complicated. 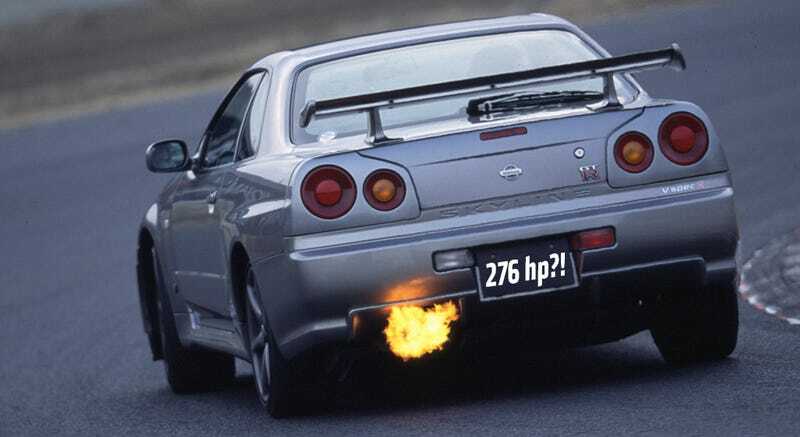 In the case of the Nissan Skyline, one of the most famously horsepower-underrated cars ever, the “276 hp” figure was given because of what we now refer to as “the gentlemen’s agreement” among Japanese automobile manufacturers to keep power levels below 280 hp around the 1990s. The Japan Times has a fairly complete explanation as to why this unofficial-but-actually-official mandate was in place, but basically: decades ago it was believed that keeping cars slower would help curtail criminal culture on Japanese highways and generally improve road safety. Automakers decided they could be good corporate citizens by limiting power. But as time wore on, companies started pushing more power to their cars anyway and just “claiming” they made under 280 hp. Later, it was determined that there wasn’t as much of a correlation between horsepower and road safety as initially thought, and by that time Japanese automakers were already chomping at the bit to duck the shackles of the arbitrary power limits they were operating under. In 2004 the “limit” was abandoned, and today’s GT-R Nismo is rated to 600 hp. Most every auto enthusiast knows about the Skyline’s situation, but according to CarThrottle the V12 Toyota Century was also stifled, albeit slightly, by the “agreement” and actually made more like 300 hp instead of its claimed 276. American muscle cars went through a similar phenomenon of industry-wide underrating, supposedly in an effort to sneak around escalating insurance costs and certain racing regulations. The most egregious example, according to this video, is the Ford Mustang Cobra Jet, and the Chevy Camaro and Corvette much later. In Germany, the Porsche 959's output figure is allegedly underrated by as much as 50 hp as CarThrottle claims it’s good for almost 500 hp. More recently, today’s BMW M5, the F10, is rated to 560 horsepower but supposedly sneaks closer to 600.